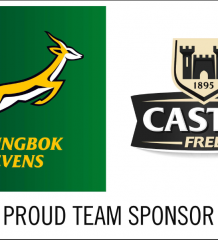 “Let the team do the work.” That is the message from Neil Powell, to his Springbok Sevens team as they find themselves in a potentially difficult situation before in this weekend’s HSBC Singapore Sevens tournament, to be played at the National Stadium on 28-29 April. 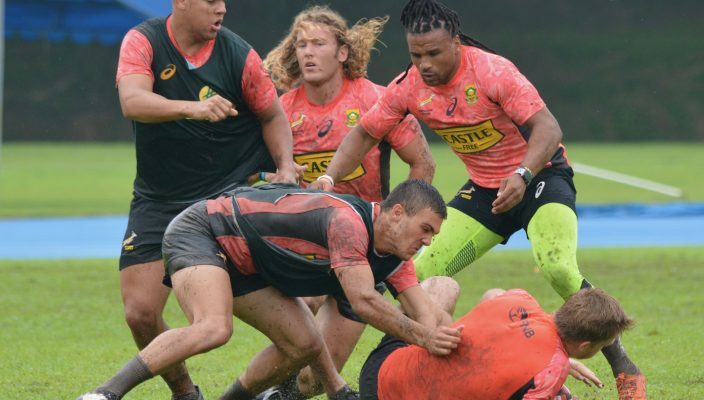 The Blitzboks have arrived for the tournament, the eighth of ten in the HSBC World Rugby Sevens Series, with a combination of young guns who played in Hong Kong, and a number of more senior players who featured at the Commonwealth Games a week later in Australia. The Hong Kong team claimed bronze, while the team in Australia missed out on a podium place by finishing fourth. “We have one group of guys who are very keen to maintain their form from Hong Kong and show they deserve a permanent spot in the team, and another group itching to redeem themselves after the disappointment of Australia,” Powell said after a solid training session in hot and rainy conditions in Singapore. “It is great to have 12 players all wanting to prove a point; the danger will be if they wanted to do so as individuals. So the message is a simple one, play as a team and we will achieve more. The Blitzboks lead Fiji by three points on the overall log and Powell said their focus this week will be on the way they play and implement their processes. “We are not looking at outside factors such as the standings or what other teams are doing. We will try to implement what we want to achieve and the results will look after themselves if we manage that,” Powell said. The Blitzboks face Samoa, Canada and Argentina in Pool C of the tournament.